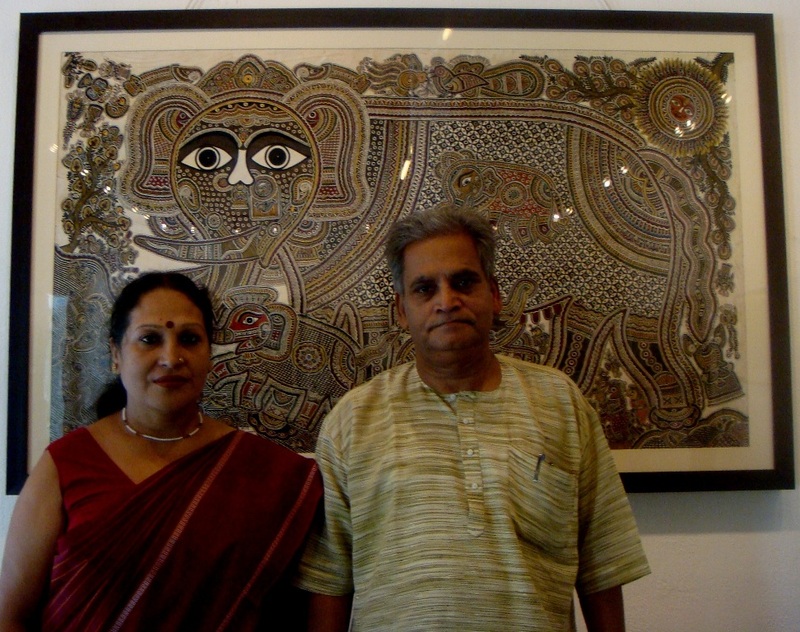 The husband and wife duo Satyanarayan Lal Karn and Moti Karn are National Award winning Mithila artists. The couple were introduced to the art by their Mihila artist mothers at a very early age – Satyanarayan was nine and Moti was seven. Today Satyanarayan, 56 and Moti, 49 have mastered the art that their work has won international acclaim. “We don’t use chemical paints and synthetic brushes. We prepare the paint ourselves by grinding flowers and leaves and use thin broom sticks as brushes. We never buy flowers and leaves or pluck them. We pick them when they have fallen naturally,” says Moti. “We are not slaves of the colour. The colour is our slave. We draw whatever comes to our mind,” adds Satyanarayan. Mithila derives its name from the birthplace of Sita from the epic Ramayan. There are two categories of Mithila paintings – floor drawings or aripana and wall paintings or bhitti chitra. Floor drawings are done on special occasions like births, first hair cut, thread ceremony, marriage and death while wall drawings are done regularly. The art is normally handed down from mother to daughter. Moti’s mother Karpoori Devi, is a National Merit Certificate winner while Satyanarayan’s mother is Padma Shree Jagdamba Devi. The couple have two children. “Our younger son is interested in the art. When he paints he uses modern themes but we use traditional themes,” says Moti. Mithila art involves intricate workmanship. Generally, there are no blank spaces in the paintings. The couple usually concentrates on themes based on nature, society and religion. The Karns work together on every piece of art. They both start on either sides of painting and come together. They have mastered the art so well that it looks like one person has painted the entire piece. Each painting is unique and can never be replicated. The cost of each painting ranges from Rs. 20,000 to Rs. 2,50,000. Today, there are about 150 – 200 Mithila artists in the country. “The government does not promote the art. There is a Mithila art museum in Japan but not in India where it originated,” says Satyanarayan who works at National Bal Bhavan in Delhi where they train students in various art forms. The couple is planning to start a Mithila academy in their hometown in Bihar where they have already bought land.